The ANC’s delayed elective conference finally kicked off in Mangaung on Sunday, but not everyone was inside the big tent. Outside the venue, disgruntled members claimed they had been unfairly excluded from proceedings. By Greg Marinovich, Thapelo Lekgowa and Erin McLuckie/NewsFire. Day one of the ANC’s 53rd elective conference in Mangaung kicked off despite numerous branch delegates being denied accreditation to attend and vote for the ANC’s leadership for the next five years. In the run-up to the conference, the tensions between the pro- and anti-Zuma factions saw a death and attempted assasinations in North West province, as well as intimidation and violence. The ANC ruling body’s response to a Constitutional Court order on Saturday interpreted the court ruling setting aside the November election of the Free State provincial executive committee as only invalidating the actual twenty-member PEC, and not the entire Free State delegation of some 324 voting members. As television screens in a restaurant across the road from the conference venue carried a live broadcast of President Jacob Zuma being noisily welcomed by accredited delgates, former Umkhonte we Sizwe fighter Mpho Ramakatsa spoke to a handful of journalists. “It is clear that the ANC is not in safe hands with comrade Jacob Zuma or comrade Gwede Mantashe,” Ramakatsa said. Despite this assertion, the group of disgruntled Free State members, led by Ramakatsa, would not be contesting the ANC NEC’s decision that only twenty voting members were barred. When questioned about communication between himself and ANC secretary general, Gwede Mantashe, Ramakatsa stated that the secretary general had displayed an attitude of arrogance. While the dissidents may have won a landmark court victory, it seems to have had little effect on the Zuma juggernaut. At the same time, other dissatisfied ANC members were holding a meeting in the township of Mangaung, on the outskirts of Bloemfontein city. While Bloemfontein, the formerly all-white city, is bedecked with ANC bunting and banners, the still all-black township has no such festive finery to cheer its bleakness. 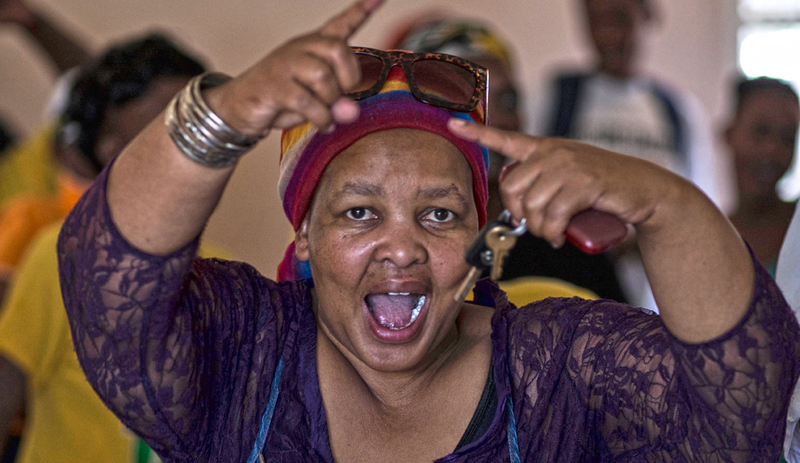 The meeting boasted some one hundred Free State ANC members who sang anti-Zuma songs. They used the substitution symbol from soccer as a sign for leadership change. The meeting was addressed by ANC Mangaung regional co-ordinator Mpho Majanaga: “The ANC is declared politically dead by its branches. The conference is to bury it.” He said that the conference is more important than just the ANC. As he spoke, several delegates from Eastern Cape, Mpumalanga and North West Province joined the meeting.